Added function that takes image from incoming tweet, finds most common color in the image and writes it to the LEDs. Added fading between colors instead of just jumping between them. Added routine to respond to users when an error occurs in their tweet, like it’s missing a color or something is spelled wrong. Re-Wrote most of code into an objects and methods on that object to get rid of global variables. It works pretty well. If you look at the code, you’ll see that I tried to make it as modular as I could so I can possibly improve the color detection algorithm moving forward without making major changes in the code. This required the system to have some kind of memory to keep track of the current values written to the LEDs. Originally, I was using global variables to solve this problem but it wasn’t all that clean so I made it all more object oriented. As for the fading You can sort of see it in the video, but the fading between colors looks really nice, especially from and to opposite complex colors like purple to orange. A big problem I had with different people using the project was that sometimes people would use an invalid color. I implemented a default message to send if a received tweet didn’t have a color in the text or didn’t have an image in the body. 6. Now enter your twitter api information into the heyWPI.py file at the top of the heyWPI class. If you don’t have twitter API info click here to get that for free! You should be ready to rock and roll on the software side, now let’s look at the hardware schematic. 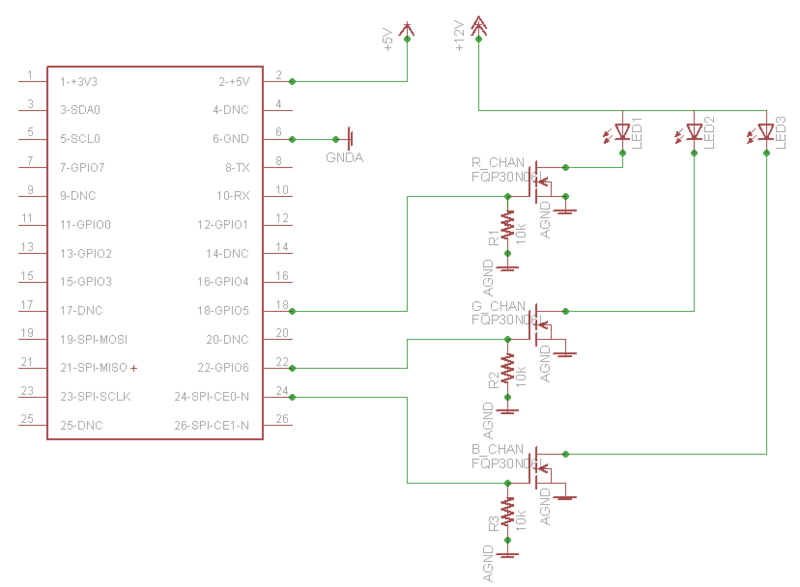 I’ve tried to make this as simple as possible, but it probably isn’t the best way to drive these LEDs, moving forward I’d like to drive these strips with a constant current. If you end up building this let me know! Here’s a video of the whole thing in use! Using the python library, tweepy, getting the twitter interaction to work was actually very simple. The downside is that I can only retrieve mention data every 60 seconds due to Twitter’s API rate limiting. The circuit is very simple, the RGB led strip I have is common anode, so I used N-Channel mosfets attached to pins 18 (Red), 23 (Green) and 24 (Blue). For the camera, I’m using a spare raspberry pi camera module I have. For the names of the colors you can write to the lights, I went with the 140 X-11 colors. I figured it was a good spectrum of colors. The source code for the whole project will keep getting updated, so check here for the most recent versions of each file. I’d love to expand the scale of the project, if you’re a student at wpi and would like on of these in your window, please email me at the addressed listed in the about section of my website.